Recently, we began working with a service provider based in North America that serves the energy market. The company’s networking team is responsible for providing Internet access to up to 2000 remote locations at any given point in time. These remote sites use a variety of satellite, and High Speed Packet Access wireless broadband transport networks to provide Internet connectivity through the company’s data centers. The original goals of the team were fairly straightforward, to use traditional bandwidth management and QoS techniques to guarantee that specific application types are given a certain percentage of the available bandwidth at each specific location. To meet this objective, we deployed Exinda Network Orchestrator at the Network Cores, using our traffic-shaping feature set. As we got more involved with the company’s long term goals, we discussed how we could leverage Exinda technology to help drive the move from a standard flat rate subscription model, based on the network access speeds, to a consumption based service model that would improve their networking services offerings and more uniquely serve their customer base. Traditional one-time billing is fairly straightforward and easily understood. Adding a subscription component to a flat rate based offering brings benefits to both the service provider, as well as the subscriber. Usage-based billing typically combines aspects of traditional flat rate billing plans with the ability to monetize utilization. We used Exinda Network Orchestrator’s Adaptive Response feature set to provide a usage based Internet access service. The Adaptive Response feature allows administrators to specify rules based on data transfer, which dynamically populate Network Objects. These Dynamic Network Objects may then be used in place of statically created Network Objects when configuring Optimizer Policies. This functionality allows the system administrator to create policies which automatically restrict a user’s bandwidth once a set upload, download, or bi-directional transfer limit or time-based quota has been exceeded. The Exinda Network Orchestrator has the capability to impose a time, or usage-based quota on a network host, and enforce a specific behavior once the quota is reached. Exinda enforces the response behavior up until the quota period expires. For example, a network host is normally managed by a rule that guarantees 2M access speeds up until a 5G daily download limit is reached. Once that limit is reached, a new policy is dynamically applied to still provide guaranteed access for critical services, but non-essential services are held to a 500K bandwidth limit. Exinda enforces this behavior until the daily, weekly, or monthly-based quota restarts. Create a source object – Using the Web UI – navigate to System | Objects | Network Objects and create a Network Object that defines the Users subnets. This can be a specific subnet, subnet range, multiple, non-contiguous subnets, or all internal or external hosts. Name: Give the rule a name. Source Network Object: The Network Object used as a source of IP addresses. 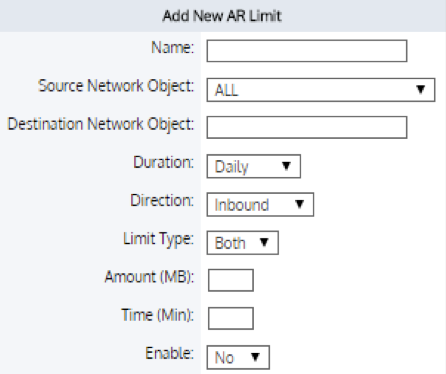 Destination Network Object: This Network Object will be created and will contain all the IPs from the Source Network Object that have exceeded the Adaptive Response limit. Duration: Over what period the limit will apply. Daily, Weekly or Monthly. Direction: In which direction should data be accounted? Inbound, Outbound or Both. Amount (MB): The data limit (quota) in MB. This rule ensures that any, gets placed in the Quota Exceeded Dynamic Network Object once they have transferred (downloaded in this example) more than 5GB in a day. At the end of the day, the Quota Exceed Network Object is reset. Once you are happy with the rule, click the “Apply Limits” button. This will load and activate the rule and begin populating the Destination Network Object. We are able to offer guaranteed bandwidth for critical services that their customers rely on, but also let them know when they have exceeded their quota and provide the ability to upgrade the service offering based on the need to exceed their defined quota. A key element to enable this type of service is data collection. Data Collection, in this context, is a mediation technique where the network resources are mediated for use by the billing system put in place by the provider. In our work with this organization, the need was to deliver information about which customers exceeded the quota and what application traffic was starting when the quota was first exceeded. This provided the necessary reporting to be able to produce usage details back to their customers and to justify the network services spend. Want to move to a consumption based networking services model? Let us show you how. Book a Demo. nice networking model.for best networking service,Managed Service Providers at Flight case help in providing the delivery and management of services that are network-based.